My end goal is to work from home by a beach. I can work towards this now by researching and developing what I need to create the Eco Pod that will eventually be moved to a beach. I presently pay a mortgage, power, rates and commercial rent but if I reduce my costs and woirk from my Eco Pod I could work a lot less and do more of the things I like. I love learning and having projects but Eco Pod also opens up other business opportunities. This page is the main area where you can access my blogs and research on developing the Eco Pod. I want the entire process to be free so others can do what I'm doing and make their own high tech tiny house for as little cost as possible. This document outlines guidelines such as being sustainable and affordable that I'll continuously refer to when developing the Eco Pod. View Google Doc here. Shows the design processes I'm following to build Eco Pod. 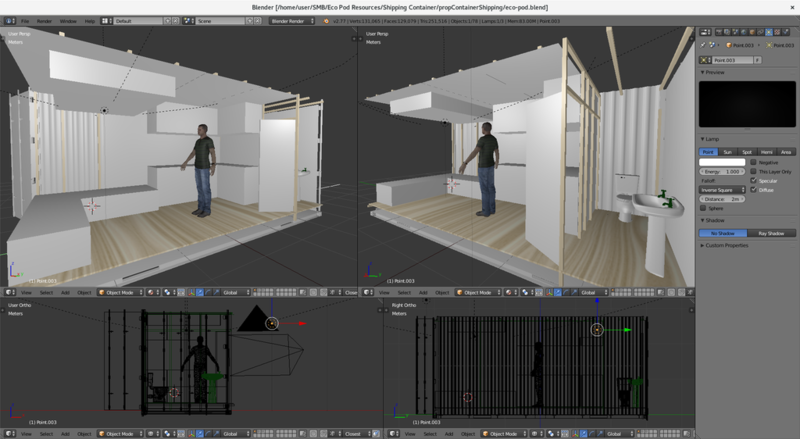 Designing Eco Pod in Blender 3D to understand what materials and additional resources I'll need.